Most of us read the training books and do the best we can to apply them in the saddle. We all think we define those words the same way, but we don’t all get great results. Maybe you aren’t a flawless rider but you’re not a total disaster in the saddle either. If you are in the immense gray area of riders in the middle and trying to do better, consider this: A small adjustment in timing can make a huge difference. There’s an instant where a horse and human partnership becomes adversarial, and I want to magnify that instant big enough to recognize, so you can have a do-over. Humor me, this gets a little fussy on paper. Whack! Time’s up, pencils down, time for a spanking! Did you give him enough time? Is it possible that you interrupted him just as he was preparing to go? Maybe in the same instant he was answering, you judged him as disobedient and escalated the cue, with more leg or maybe a tap with the whip. (This is the important instant!) If the timing is off, it can feel to the horse like he just got punished for trying. If the correction was too fast or hard, he wonders if the first cue was not a cue for forward, but instead a warning that a correction was on the way. Then instead of going forward at the first cue, he’s learned to learned to anticipate the wrong thing. Next the rider prepares for an even bigger cue. This is going to need strength (we think), and maybe he will resist more, so the seat stops following and the legs grab on (the cue for a half halt, if not a full halt) and the reins get tight because that’s what the rest of the body did. Lots of horses consider set hands that don’t follow the exact same thing as pulling back on the reins. You can disagree but he’s actually the one who gets to judge this part. Now the leg kicks hard enough to bruise a rib. It’s a conflicting message, legs say Forward but seat and hands say Don’t you dare. Here’s the problem: Your brain is spinning for obedience so you don’t notice how much the rest of your body is working against it. You’ve seen other riders here, haven’t you? And by the way, as you have been thinking in your head about what to do, and he’s been trying to respond somehow in his confusion, your partnership has become adversarial. Frustrated. And now both of you are thinking Whatever I do is wrong! Have three minutes passed since the first ask for forward? How’s the ride going so far? They say the definition of insanity is doing the same thing and expecting a different result. 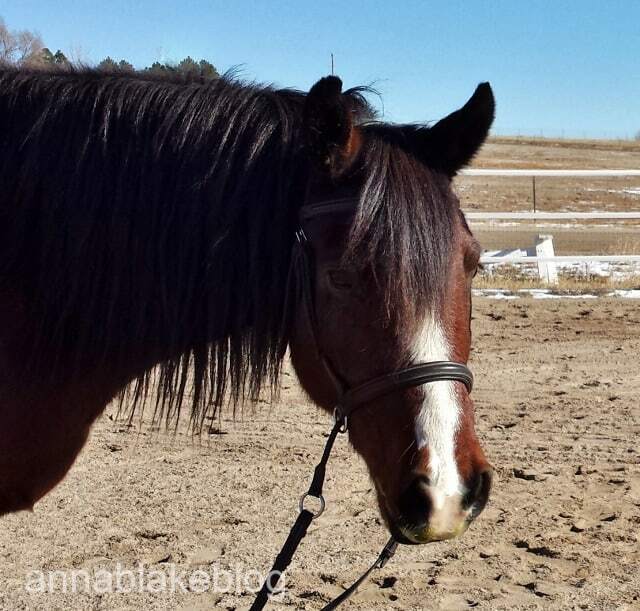 It follows that if your horse needs improvement, it has to start with you. For a rider that means improving your perception in the saddle and illuminating the dark little corners of communication. The training conversation has to go deeper than the surface perception. Does this method seem slow? Should a leader demand more, better, faster? It’s absolutely true we want our horses to be more responsive, but that’s trained differently. It’s lots of walk-trot transitions that pave the path to enlightenment! In the beginning of the ride, the transitions won’t be perfect. Say thanks and ask again. Tune him up by rewarding the good, that’s a far different intention than correcting. Horses and riders are always working on a tendency towards partnership but we even define that differently. Do you want dominance or responsiveness? Seriously, they are not the same thing. The reason this instant in the timing of a cue matters so very much, is that it’s the moment when you let your horse know who you really are. It’s a long and winding road…. but its the journey that is the fun part. The great thing about horses is just that, we all still have a ways to go. Very timely…experienced this today. At the end of my ride, my thoughts were, “am I expecting too much? Are my standards too high? Am I being fair?” Next ride, I will give it another moment…another breath…thank you. Always good questions to ask. The thing I like best about ‘low standards’ is that I get to say Good Girl more often. Karan, we are ALL working on it! And that’s the good news for horses… and of course mules! This is really well explained. That moment to breath can make all the difference in your relationship with your horse. Love this comment! and as long as there is communication, why judge?